Blurb From Goodreads:From the author of the New York Times bestseller Swamplandia!, and finalist for the Pulitzer Prize, an imaginative and haunting novella about an insomnia epidemic set in the near future. Why Read: For someone who doesn’t normally listen to audio books normally if at all, it was an interesting experience to not only listen to one, but one which I had never read before. 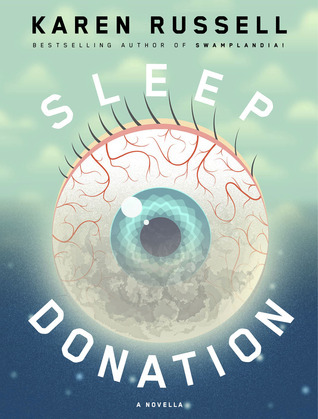 However, Sleep Donation was such an interesting concept that I really could not imagine myself not reading or at least knowing what would happen in the book. Review: The audible experience of listening to a book like Sleep Donation was something like mind-blowing. Not only did I really appreciate the plot, characters and backstory, having a different medium by which to listen to stories was an eye-opener for me. It probably didn’t help that the story was about nightmares and a dystopian world based on the lack of sleep… and my general listening time would be in bed with the sleep timer on. The story itself was one of those interpretations of the future that rung so true in my mind that you can’t dismiss it. What we jokingly refer to as insomnia in college students has a real disease part to it – living in the psuedo-world of tests and dorms, students talk about stress in school being the reason why. In Sleep Donation’s world, the reason is no more sinister than a new pandemic, one where you catch insomnia. Probably one of my favorite parts of this story was how scientifically plausible it all seemed, and how matter of fact it all sounded. The twist, you could say, is the Donor Y Nightmare, which begins to infiltrate people’s dreams to the point where there are people with real insomnia and those who are insomnia elects, who are too frightened to sleep. They never tell us what the nightmare is, and you’re left wondering who would choose a world where you live inside a laboratory instead of dealing with the nightmare. Tris Edgewater was the main character, the recruiter who used her sister’s memory to get sympathetics to donate some sleep to the cause. While I cannot say that I didn’t empathize with her situation or her internal monologue, I certainly found some of her internal thoughts annoying to the point of whining. If I had to choose one point of the book to sell, it would probably be the whole concept of it. Much of the time when I wasn’t listening to it on a walk or about to fall asleep, I would be haunted by the different thoughts and possibilities of falling into a world like this – where human greed and human weakness overlap and converge in ways which may end with the world not so much better off.